Saturday morning got underway early - perhaps after the Beermeet the evening before a little too early... then I found that Starbucks was closed, which scuppered my breakfast plans. Grabbed some orange juice and a quick chat with Tony Cassidy before heading to grab a seat at Sharon Witt and Helen Clarke's session, which I knew was going to be totally awesome. The first session of the day was again over-subscribed, and over 60 people squeezed into the room for a much-anticipated session. 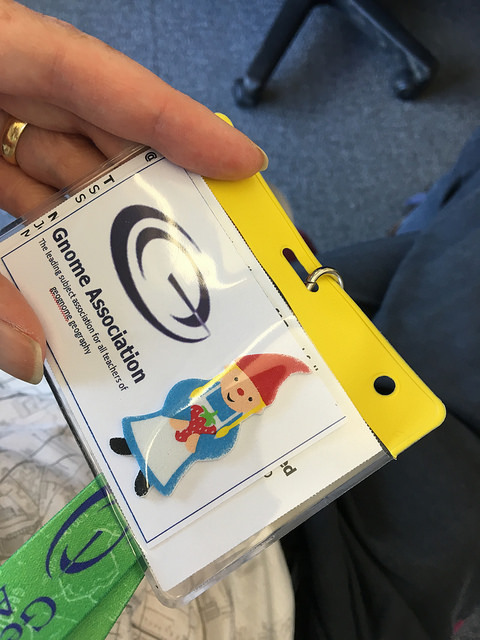 Sharon Witt and Helen Clarke launched their ‘gnomifesto’ for curriculum making and provided a huge range of ideas connected with gnomes and their place in the world. They talked about how gnomes could be used as a context for exploring the curriculum. They started by explaining that the word gnome comes from the meaning “to know”, so with the knowledge-turn, gnomes are ideally placed to contextualise this for students. They described the ways that gnomes can be used to help young people explore (un)familiar places. We had a go at producing words that gnomes might give to landscape and urban features. I was able to share some of the word-hoard that teachers had developed with Robert MacFarlane who had inspired the original activity, using Twitter. He took the time to reply and ask for a little more information. If children speak the language of “childish” when describing landscapes, this was about developing the idea of “gnomish”. We had gnomes as urban explorers, and geologists. Sharon shared an urban streetscape activity, which she had adapted from an activity that had been used by Stephen Scoffham at the Charney Conference (see previous posts). There were hats, puppets (a variation on the pigeon geographies of the previous year) and a special badge to induct us into the Gnome Association. For Early Years practitioners, they provided a range of ideas, including some ‘simpler’ ones such as “what is as red as a gnome’s hat”, or “what is the same shape as a gnome’s hat”. It was playful and imaginative and the highlight of the conference for me.